Never Let It Be Said… | Main | The Future Of Knitting? I am back amongst the living. This flu-thing was horrible. I still have little energy. But at least I feel sort of OK. All I can say is… get your flu shot! Thank you, gentle reader, for your kind wishes. Really, it meant a lot to know that people actually wonder what happened to me if I disappear. Speaking of disappearing… Has anyone heard from Maia? She hasn’t blogged for a long time and isn’t responding to my emails. I would just like to know if she is OK. If you have heard from her, please let me know! OK. I have actually pseudo-knitting content — pseudo because I haven’t actually been knitting anything at all. I went to knit night last Thursday at Tangle, knit about three rows, sat and stared at everyone, and left early to go home and go to bed. Really exciting around Chez PI it has been lately, let me tell you. So here is pseudo-knitting content. These lovely pins, being modeled by the PNW Shawl, are from Yarn Overs: Handcrafted jewelry for you knitted garments, and are hand made by Robert Howard in Colorado. The one on the left, Rings, is brass. 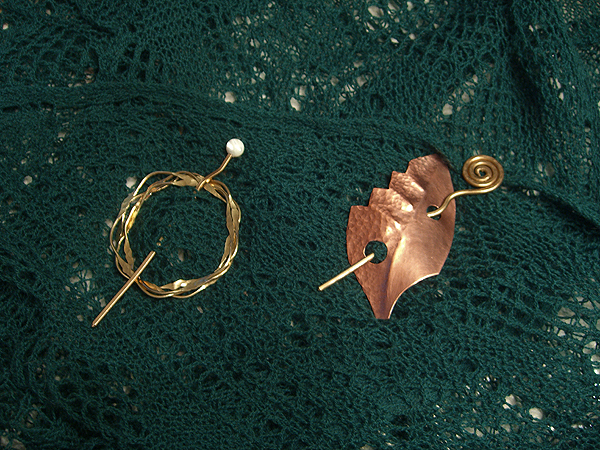 Leaf, on the right, is copper. These two, and others of Robert’s creations, are available in copper, brass and nickel silver. Go. Order. You know you want to! So what are y’all doing for whatever winter holiday you celebrate? #1 Son is currently in California on tour. He will be back in time for Christmas (our holiday of choice, more or less), but will be leaving again on New Years Eve and will be gone for 5 weeks. I will miss him as he will not be able to call me much. But the little birds have to fly, eh? Somewhere in there I can hopefully catch him long enough to get a picture of the scarf. Glad you are feeling better. You know you’re really sick when you can’t even knit! Dh and I have no siblings nearby, only one parent left (saw him in September), and we already got our Christmas present, so we will probably play games and relax on the day. Last year, on a whim, we took donuts to the local fire station – it felt so good brightening their day! We may do it again this year. I assume Maia is recovering from the Bizarre Bazaar, but I can’t be sure. I’m glad you’re feeling better — I was getting worried about you! Now don’t start running around too soon and relapse. I miss reading you when you’re not around. Glad that you are feeling better. Just make sure that you take it a bit easy so you don’t end up “sick” again. This crud takes a long time to go away. I am impressed with your blog. I donâ€™t recall now how I stumbled across your page, but I find itâ€™s the blog Iâ€™m going to more and more. I love the yarns* you weave as you detail your knitting adventures!!!! Managing to knit your #1 son a scarf while you were down w/a cold fed into so many of my own inclination. My children, single parenting, yarn, color, knitting (though compared to yours, my knitting is pebbles, Iâ€™m working on my first pair of socks, thatâ€™s its own story, but I am plugging away). Youâ€™re very talented both in yarns and in words. Iâ€™ll be checking by often (actually, Iâ€™ve already placed you on my links tool bar!!! Thatâ€™s sayinâ€™ something!!!!). Hope you’re back to feeling your best soon!!!! Glad you’re feeling better. Thanks for showing us the beautiful shawl pins, you always find such neat stuff. What will we do for the holidays? Several “gifting & eating” sessions with different branches of the family, but THE day is at my house with grandkids and my best friend. I’ll cook, everyone brings something, we do gifts. Then when the little ones go home, best friend and I will knit! I missed part of your down time (else I’d have pestered you too) with my own down time, and so much busy stuff going on that I’m weeks behind in blog reading.